The holly or ilex genus is comprised of 400 to 600 species of deciduous and evergreen shrubs and trees with leathery toothed, serrated or spiny leaves. The inconspicuous flowers are white and female plants carry showy red fruits during the autumn. With these bright red berries, the evergreen ilex aquifolium (common holly) and ilex x meserveae (blue holly) species reach the look that they are best known for, since this combination with its shiny green leaves is highly popular as a Christmas decoration. 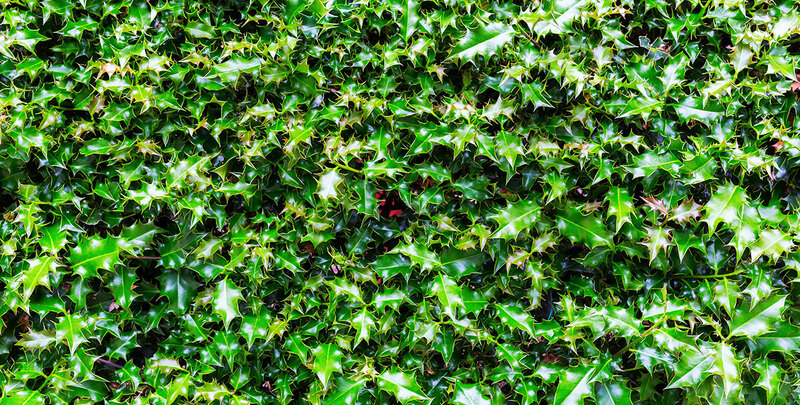 Holly can be used for several purposes, but as many parts of the plant are mildly toxic, ilex species are most commonly known and cultivated as an ornamental plant, which – partly due to its impenetrable nature – has excellent qualities for use as a hedging plant. It is hardly surprising that ilex species is inextricably linked with the holiday season, as holly is at its most colourful during the colder months. That does not mean that the aforementioned species have no ornamental value during the rest of the year, as they hold on to their elegant leaves year-round These sharp, spiny leaves will not only keep grazing animals away – they also form an impenetrable barrier for unwanted human visitors, making holly very suitable for security hedges. 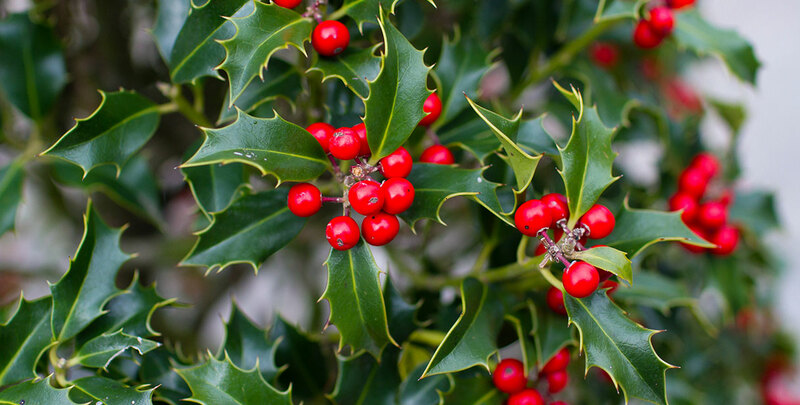 Combined with the mild toxicity of its berries and leaves, this may make holly seem like an unfriendly plant, but it also offers protection to birds and other small animals. Moreover, its scarlet berries provide an excellent food source to birds during the months when food is scarce. Holly has been around for many centuries. During the Roman era, the genus already got its name “ilex”, which, strangely enough, literally translates to “oak”. The foliage of the holm oak does bear some resemblance to that of holly, which may explain the origins of the botanical name that is still used to define the latter. Before holly gained its Christian connotations during the Middle Ages – when it became considered to represent Christ – the Druids already believed that holly would ward off evil spits and therefore, they would wear holly in their hair. More recently and perhaps pragmatically, the remarkably pale and relatively hard wood of ilex species is used for the production of white chess pieces. It is also used to produce furniture. As stated before, holly species are of immense value to wildlife. They may be impenetrable to cattle and other grazing animals, but they tend to protect smaller animals, such as hedgehogs, from predators. In addition, holly hedges provide an excellent nesting habitat for birds. Birds also enjoy the scarlet berries that grow on female holly trees, as they become soft and edible during the winter, which is exactly when food is rather difficult to find otherwise. This is also how birds help disperse the seeds of holly species. Please keep in mind that the ripening process only makes the fruits edible to birds; the berries will remain mildly toxic to humans even after they are ripe. Consumption may lead to gastrointestinal distress. 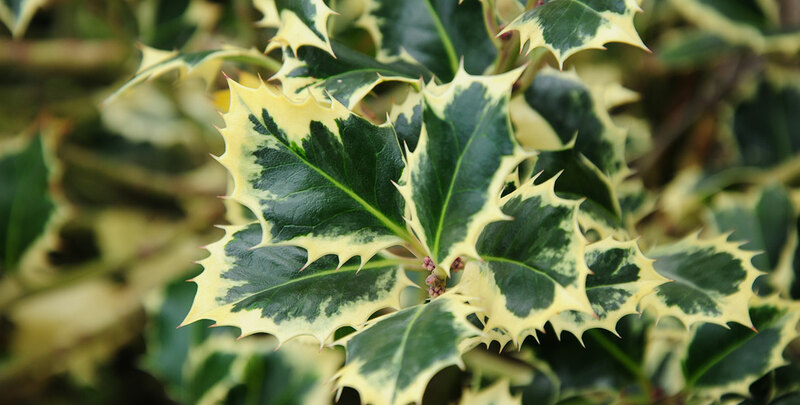 Holly is a native, undemanding plant with a high tolerance of just about anything. The common holly, also known as English holly or European holly, is exceptionally hardy and will happily grow almost anywhere. It will do well in the sun, in semi-shade or even in full shade and on all soils except extremely wet ones. A well-drained, slightly acidic soil is best and some compost may be added to the planting hole for optimal results. The sharp thorns will repel grazing animals, so even though holly is slow-growing, with an average growth rate of 10 to 20 centimetres per year, it is unlikely that grazers will damage it and prevent it from becoming a decent hedge. Ilex aquifolium hedges can grow up to 5 metres in height, but this may take decades. Ilex meserveae, a hybrid between ilex aquifolium and ilex rugosa does not reach these levels and stops at 3 metres. Both are perfectly suited for mixed hedging. Aquifolium can even be found growing inside other hedges in the wild. If berries are what you are after, make sure you always combine female plants with male ones. Ilex aquifolium is unisexual and is normally sold as a mix of male and female plants, while some hybrid cultivars are either female (‘Heckenfee’) or male (‘Heckenstar’). This will always be clearly stated in the product description. One male plant mixed with four or five female plants should do the trick. As they are native to parts of western and southern Europe, including the UK, ilex species make excellent hedging plants for gardens in our part of the world. Their popularity as a Christmas decoration is justified, but it is just one of the many different ornamental possibilities that holly has to offer. Ilex species are great security hedges due to the impenetrable nature of their dense growth and prickly leaves, but they are also very suitable for mixed hedging. As holly is very tolerant of pruning, the only precaution you will have to take when trimming your holly hedge is ensuring you wear protective gloves. 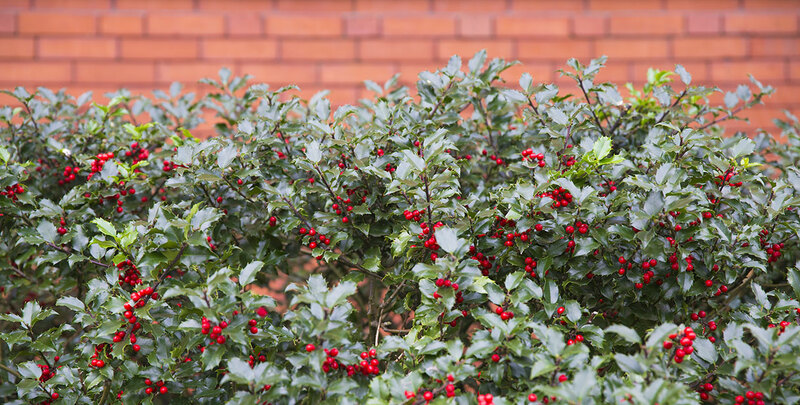 Being slow growers, holly hedges have a long lifespan of up to 100 years. Depending on the conditions, they can even reach 500 years of age as a tree. So with the proper maintenance, a holly hedge will remain loyal to you for a lifetime. As an evergreen, holly will provide privacy and a healthy green look throughout the year and if you desire some more colour in your garden during the winter months, the bright red berries of female hollies will give you exactly what you want.